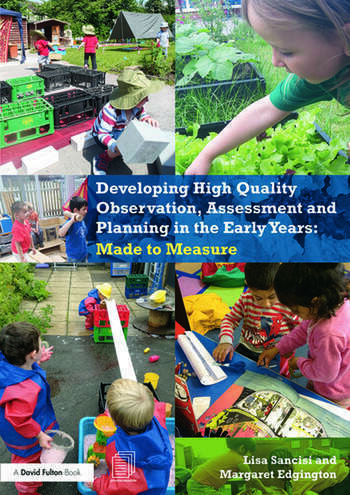 What is meant by high quality observation in the early years? How do you devise effective next steps for young children that build on their interests? How do you ensure that you meet the needs of all the children in your care? Offering a fresh approach, this practical toolkit offers a complete guide to observation, planning and assessment in the early years. It clearly explains the principles of good practice in this area and provides training tools to help practitioners develop their knowledge and skills and embed these principles into their setting. The focus throughout is on helping practitioners to create their own systems for observation, planning and assessment that are appropriate for the children they work with. With fully photocopiable resources throughout and including downloadable training sessions to accompany the book, this is an essential toolkit for all early years managers, leaders and those involved in setting support. Lisa Sancisi has been an Early Years teacher in primary schools for over 20 years. For the last 6 years she has also worked as a children’s centre support teacher as part of Hampshire’s Early Years Advisory Team supporting settings and schools, delivering training, profile moderation and supporting family learning in children’s centres. Margaret Edgington is a specialist in work with young children, having worked as an Early Years teacher, educational home visitor, advisory teacher, NNEB tutor and nursery school head teacher. Most recently, she has offered a training, advice and consultancy service across the UK (and sometimes abroad), and written on the subject of early childhood education, including her books The Foundation Stage Teacher in Action, 3rd edition, 2004, and The Great Outdoors, Second Edition, 2014. She has worked as a mentor/consultant to a number of nursery and primary schools, day nurseries, pre-schools and children’s centres. She is a Vice President of the National Campaign for Real Nursery Education and a founder member of the Open EYE Campaign.